I have been a fan of these little Montagne Jeunesse Face Masks for some time - they all smell gorgeous - good enough to eat in fact - are packed with natural goodness and the brand is against animal testing. 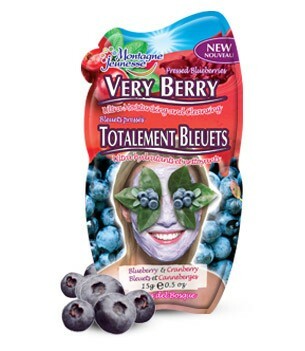 They have just recently launched a new indulgent Very Berry Face Masque, that's crammed with gorgeously juicy cranberries and bursting with blueberries to their range. It promises to give your skin the benefits of these super fruits, leaving it feeling revitalised, refreshed and cleansed. After cleansing my face, I applied the masque to my dry skin and distributed evenly over my face and neck using my fingertips, avoiding the eyes and lips. The masque has a lovely rich creamy texture and smells fruity and fresh. I then left the masque on for 10-15 minutes whilst I relaxed and let the ingredients work their magic. I rinsed thoroughly with warm water, patted dry and then applied my usual moisturiser. My skin looked plumped and refreshed afterwards and definitely more hydrated, this is a perfect weekly treat for autumn as my skin tends to get dry in the colder months. What are your favourite Montagne Jeunesse skin care products? Oh was, I was always a bit not sure about those littl packets, bit I think I'll go and try one now :).